The reason for this individual port is that I plan to make adjustments, variations and additions beside allowing people to just select single swords. 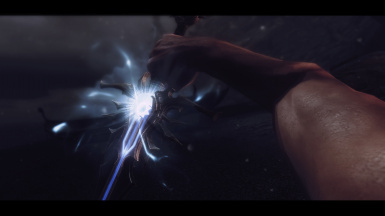 L3st4t and I talked and might bundle future enhancements into one mod that will allow you to choose between variations, additions and individual swords. Oh my god... I found it. Thank you, thaaaank you! Could you please make a version without the enchantment? is there any way to use other enchantments on it? Is it only One-handed or there's a Two-handed version as well? Awesome sword! One question, how do I get the Twin Secrets to improve it? - Jarl's Longhouse (Winterhold), inside a basket in the southwest corner of the Jarl's bedroom. - Serpent's Bluff Ruins (Whiterun Hold), on the Arcane Enchanter at the end of the dungeon. I can't find the twin secrets in calcelmo's laboratory where do you put it? Has not been moved by the mod. If it cannot be found at one of the vanilla locations in your load order, then some mod might have moved the item. - Treva's Watch on the far northwest side of the map up the stairs. It sits on a table next to the Arcane Enchanter. - Calcelmo's Laboratory on the table across the room from the Arcane Enchanter. - Shrine of Stendarr just southeast of Swindler's Den. - Serpent's Bluff Redoubt on the enchanter's table. - Jarl's Longhouse in Winterhold, in the ground-floor room on the right, inside of a basket on top of a barrel. all swords missing, keep finding the book twin secrets the exact locations of where your swords are supposed to be. 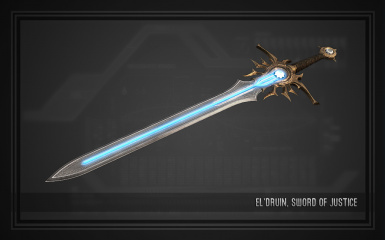 With a name like Skycutter I figured it would have a long range slash power like the Bloodskal Blade except blue. Still looks cool. What exactly does the enchant on it do, by the way? You can make it a Dawnbreaker replacement easily in xEdit if you want to use this mesh on Dawnbreaker. 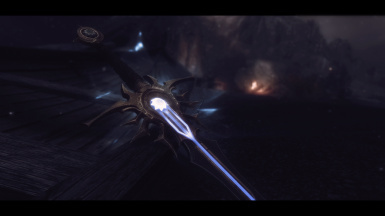 Change the FormID to the one of Dawnbreaker or change the meshes of Dawnbreaker to the one this weapon use. Pretty easy to change the look of vanilla weapons to new ones. If you having problems I can upload an optional replacer version. Really awsome swords you've made! really detailed and great work! I guess I'm not doing this right, a replacer version would be appreciated if you have the time. I managed to do this myself by unpacking the bsa, keeping the textures folder, rerouting the meshes to follow the vanilla Dawnbreaker mesh file path and then renaming your meshes to those of the Dawnbreaker. Excluded the esp as that is not needed for vanilla replacer only.